A recipe for a great meal is only as good as its presentation. Clarity in your business is only as good as your ability to communicate it and then implement. So perhaps your buying into to the idea of creating a vision for your business as the recipe for growth. What's next? Gazelles One Page Strategic Plan provides clarity and action steps to not only broadcast your intentions but to provide steps to get everyone on board and contributing to the momentum of your top priorities. It's the key to not only achieving clarity in your business, it provides the next action steps. You must not only indicate where you are going, you must give your team a way to climb on board and contribute. I learned very early in my leadership, management and coaching experience that people are not convinced by your vision, they are convinced by the action they see happening surrounding that vision. The One Page Strategic Plan is the right recipe for business success. Included are elements you are familiar with, Core Values, 3-5 Year Plan, One Year Plan, SWOT, Core Competencies, along with some that you may need help to create; Purpose, Actions, BHAG,Brand Promise, Profit/X, Critical numbers, Rocks, Key Initiatives and Thrusts, People [Relationship Drivers], Process [Productivity Drivers], Quarterly Priorities, Themes and Your Accountability. Anyone who tells you completing the One Page Strategic Planis a quick, down and dirty process is kidding themselves. Clients often require 12-18 months and more to complete this to the high level necessary to achieve ultimate success. It's like a recipe for fine wine. It needs time to brew and steep. As Jim Collins points out, no business becomes successful over night. Most of the One Page Strategic Plan elements come from Collins research from Built to Last and Good to Great. Combine this with Gazelles research on John D. Rockefeller, the evolving best practices and top thought leaders Verne Harnish and Gazelles coaches are constantly analyzing, and you have a dynamic tool launching your business forward. Don't expect to sit down once and finish this. In fact the One Page Strategic Plan will evolve, and needs to evolve as you include your people in it. At the far left are those elements which should remain rather static. Core Values, Purpose, Core Competencies, even your 3-5 year plan will usually remain consistent. At the far right on the One Page Plan are those elements that will be in a state of change every 90 days. These include: Your quarterly priorities, rocks, theme and individual accountability. The far right is where you determine your priorities for each quarter and enlist your people to contribute. 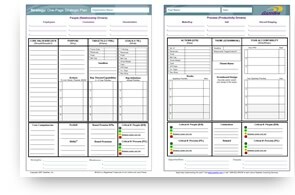 Each person in your team should be required to include on their copy of the one page plan those accountabilities they are required to perform for their job, daily, weekly, consistently and predictably that they can be measured on. They should also include those items that will contribute to the quarterly priorities the company has established. In some cases this might be a duplication of what their daily performance measures are, especially if the company is keying in on improving their department or function. The key is that not only will this tool communicate the vision for the company; it will communicate how every individual can contribute to the forward momentum. Again don't believe this is a 90 day project. In most cases getting the metrics established, and focusing on department priorities just with your executive team takes one quarter. Start slow and build up from there. Remember the caution of our previous blog, Stretch Goals - Give Them a Head Start. Don't expect immediate impact throughout the company. Instead build on the foundation, begin to realize small victories with your executive team and let the formula of the One Page Strategic Plan evolve into the vision you always wanted your business to project. Which elements of the One Page Strategic Plan do you want to explore or dig into deeper? Let me know and we'll continue this journey on bringing more clarity and action to your business.